Save SAR 60 (30.15%) – Earn 13 Shukrans What is Shukran? Shukran is the Landmark Group’s award-winning loyalty programme in the Middle East, which allows you to earn Shukrans when you shop any of our brands. Give your kid's bedroom a desired makeover with this bright and stylish comforter set. 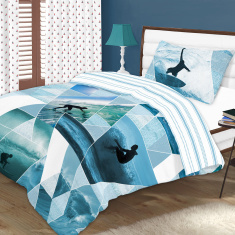 Featuring a bold and energetic print, this comforter is reversible and it comes with a matching pillow case.